Chronic pancreatitis is a chronic fibro-inflammatory disease of the pancreas, with progressive and irreversible damage to the pancreatic parenchyma. The incidence of chronic pancreatitis is quoted between 2-10 new cases per 100,000 people per year in several European and North American studies. It has a prevalence of approximately 13 cases per 100,000, with a male to female ratio of 4:1, and an average age of onset of 40 yrs. In this article, we shall look at the causes, clinical features and management of chronic pancreatitis. 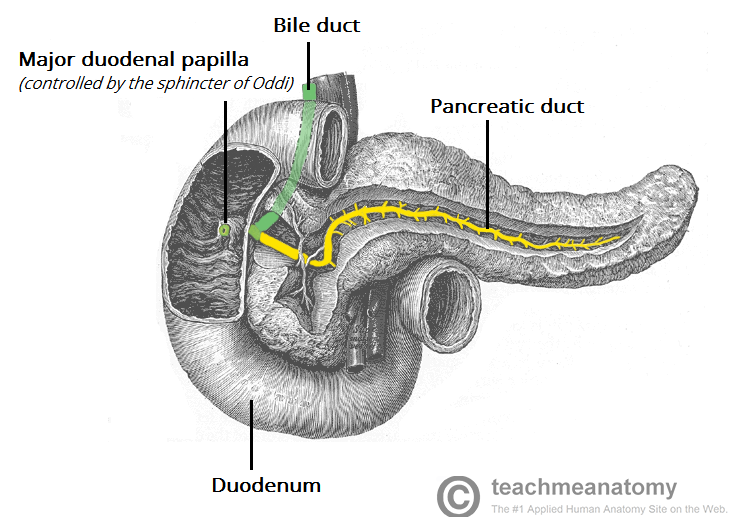 Figure 1 – The pancreatic duct. Obstruction of the duct, by stricture or neoplasm, can result in chronic pancreatitis. Large duct disease – there is dilatation and dysfunction of the large pancreatic ducts, therefore visible on most diagnostic imaging. The pancreatic fluid changes composition and facilitates the deposition of precursors to calcium carbonate stones and causes diffuse pancreatic calcification. This subtype is more commonly found in males. Small duct disease – usually associated with normal imaging and no pancreatic calcification, making it difficult to diagnose. It is predominantly found in females. The greatest risk factor for chronic pancreatitis is excess alcohol consumption; 5-10% of people with alcohol dependence will develop chronic pancreatitis. Smoking has recently emerged as a risk factor for chronic pancreatitis, also increasing the risk of pancreatic malignancy. The major symptom in chronic pancreatitis is chronic pain, which may be complicated by recurring attacks of acute pancreatitis. The pain is typically in the epigastrium and radiating to the back, partially eased by the patient leaning forward. It is often associated with nausea and vomiting. Patients can also present with symptoms secondary to endocrine dysfunction (such as diabetes mellitus) or exocrine dysfunction (such as steatorrhoea or malabsorption). Physical examination at the time of an acute attack may be fairly unremarkable and demonstrate only a patient in pain with epigastric tenderness on palpation. Occasionally, a fullness or mass can be felt in the epigastrium, which suggests the presence of a pseudocyst or inflammatory mass. Patients with exocrine dysfunction may show signs relating to malabsorption. Important differentials to consider with this presentation includes acute cholecystitis, peptic ulcer disease, acute hepatitis, or Sphincter of Oddi dysfunction. It is important to note that serum amylase and lipase levels are rarely significantly raised in established disease. Moreover, markers of nutrition such as magnesium, haemoglobin, and albumin may be low, but are not diagnostic. A relatively sensitive test for chronic pancreatitis is a faecal elastase level, which will be abnormally low in the majority of cases. CT abdomen-pelvis scan – may be performed following ultrasound if required, demonstrating pancreatic calcification or pseudocyst formation. *MRCP or ERCP can be combined with administration of intravenous secretin, causing the pancreas to produce a bicarbonate rich fluid; this may reveal a pancreatic duct stricture which may not otherwise have been evident and is therefore more accurate than standard MRCP/ERCP for detecting small-duct disease. Analgesia is the mainstay of the initial management of chronic pancreatitis, with simple analgesia plus an opioid usually being sufficient. In those with long-term pain, strong opioid analgesia is ideally best avoided as it is often insufficient and may lead to long-term dependence; instead, tricyclic antidepressants (TCAs) may be useful. Complications of chronic pancreatitis should be addressed as appropriate (discussed below). Pancreatic enzyme supplements are often trialed in an attempt to relieve the pain of chronic pancreatitis, which may be particularly beneficial in small duct disease. The definitive management of chronic pancreatitis is typically avoidance of the precipitating factor such as alcohol, management of chronic pain, and nutritional support often with enzyme supplements. Endoscopic and surgical management are possible in a select few patients to target the underlying cause. It is also important to note that many endoscopic procedures have a risk of inducing an acute-on-chronic pancreatitis, which the patient must be warned about pre-intervention. The purpose of surgery is to relieve any obstruction and remove mass lesions, whilst preserving pancreatic tissue wherever possible. A lateral pancreaticojejunostomy (side to side anastomosis of the pancreatic duct to the jejunum) provides relief in many patients but pain does tend to reoccur, as the head of the pancreas still remains in situ. A pancreaticoduodenectomy (commonly termed a Whipple’s procedure) is indicated in paraduodenal pancreatitis or if neoplasia cannot be excluded. The procedure involves resection of the pancreatic head, gallbladder and bile duct, the pyloric antrum, and the first and second portions of the duodenum, with the tail of the pancreas anastamosed with the duodenum and the body of the stomach anastamosed to distal duodenum. A total pancreatectomy is the removal of the entire pancreas, however is commonly associated with morbidity secondary to the loss of pancreatic function and reduced quality of life; in approximately one-third of patients, it does not provide analgesia. Figure 3 – Pancreaticoduodenectomy (Whipple’s procedure). A: Pre-procedure, B: Post-procedure. Steroids are effective at reducing symptoms in chronic pancreatitis with an autoimmune aetiology only. A high dose of prednisolone is used initially to bring symptoms under control; a low dose maintenance regime is then used. Poor exocrine pancreatic function can lead to malabsorption and steatorrhoea. This can initially be treated with enzyme replacements (including lipases), such as Creon®, which are typically administered with meals. Chronic pancreatitis is associated with significant morbidity and reduced quality of life. It is a difficult condition to manage effectively*. In some patients, the disease may eventually ‘burn out’ after many years of pain, resulting in residual endocrine and exocrine insufficiencies. A third of patients with chronic pancreatitis will die within 10 years and the risk is further increased in those who continue to drink alcohol. *Chronic pancreatitis due to an autoimmune aetiology is exempt from this and patients usually respond well to steroids in exacerbations or relapses. Which of the following is a known cause of chronic pancreatitis? Which of the following is the most appropriate initial test to investigate for chronic pancreatitis? Which of the following blood results is not commonly seen in severe cases of chronic pancreatitis?